After feeling like my goal of running a race in all 50 states was at a stalemate, I jumpstarted my progress this summer. I did 3 10ks over 3 Saturdays and gained Utah, Wyoming, and Michigan. I ran at 4000+ feet, 7000+ feet, and near sea level. I ran one wicked hill, several awful hills, and completely flat. I ran two in Saucony Triumphs and one in Vibrams. Hills + altitude + being undertrained is even worse. I always have a sprint left in my legs, even if my lack of oxygen makes me nearly pass out at the end. It was a blast, but I admit I’m looking forward to starting next Saturday with a beer, rather than a race. More on that beer and the individual races later. 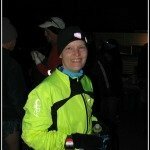 State #26: New Mexico – Half Marathon 5 of 5! that is awesome! my favorite: "Finishing IS Winning" so so true. congrats!!! Wow, that's awesome! I agree with the hills + elevation statement, but after a run like that, the flats at home are super easy. 3 races in 3 weeks is impressive! You've definitely earned that beer! Great stuff, well done! I live and train between 6000 and 7000ft. It makes a massive difference on race day. At sea level I just don't get tired. Loving "finishing is winning!" 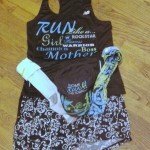 i am on my own 3 races in 3 weeks (only 2 states) and hoping for good races. Have a great vacation!! AWESOME job… I think finishing is winning needs to be your sub title of the blog. Beer as in plural, I assume. Sounds like a lot of fun! New experiences are always so enriching. You definitely are a winner! Just getting caught up here, hence commenting on your posts in backwards order. :PYou are a MACHINE! I love the reminder that "finishing IS winning." I also like that you can smile and laugh about a hard race. The good thing about a PW is that it hopefully means your next time is going to look even better. Way to go! Keep going, and keep rewarding yourself for all your great effort!